Crochet headband patterns were among the first patterns that I started creating on my own, and I still love making them today. I create them as gifts for people who love crochet, my niece, and many of my female friends. They are quick projects that give me instant gratification when I want to sit and crochet, but seem to be short on time. 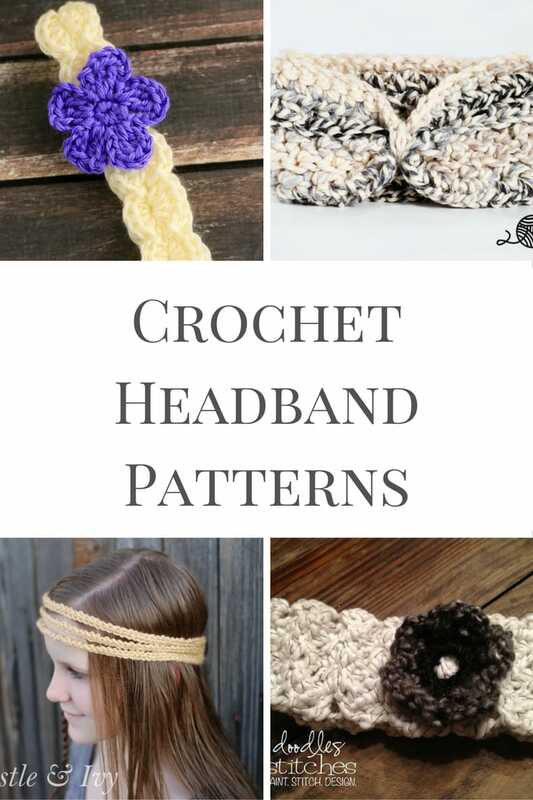 If you love the list of 20 crochet headband patterns we’ve put together for you today, be sure to check out the other Free Crochet Patterns for Headbands round up that we did earlier this year. There is a little something for every skill level and style. Happy crocheting! Dainty headband pattern for a young girl featuring a five petal flower pattern also. This poke ball themed Pokemon headband pattern features a standard headband pattern and applique. This headband is a string of hearts and is simple, sweet, and would look lovely for newborn photographs. This free crochet headband pattern features crochet cables and is sized for an adult woman. I’m loving this pattern and can’t wait to make one to warm my ears this winter! Another gorgeous adult-sized headband wrap. The twist in this design gives it a unique and fashionable look. This gorgeous headband is named the Moonlight Ear Warmer pattern, due to it’s design. I adore the different colors and texture used in this piece. Great red and black plaid crochet headband pattern. With this plaid being so on trend, I’ll have to make a few of these for gifts this year. I love the color of the yarn used in this braided headband. This post includes both written and video instruction. This headband would be perfect for spring! I love the boho style, and this looks like a simple pattern to follow. A pattern for a cute twisted headband that can be sized from baby to adult. A gorgeous, simple pattern joined by a button. This adult sized headband looks really warm. This headband is Santa themed! This would look super cute on a little one during the holidays. Beginner crochet headband pattern made with worsted weight yarn. Can be made in child or adult sizes and features a cute tie in the front. This pattern speaks to my inner geek. Harry Potter themed crochet ear warmer patterns! I love this headband joined by a cute flower pattern in the front. Be sure to check out the other headbands on this site. This pattern uses the shell stitch and is a thinner headband. Adorn with a flower, or other applique to add some additional color! I really like the look of this bright headband! I would call this a more advanced crochet headband pattern since it has several post stitches. Beautiful work! This headband looks super warm! I like the decorative button added on the side. Adorable headbands for newborns featuring a cute flower! Perfect for newborn photo props. This cute, chunky headband looks perfectly warm for Winter. Which of these crochet headband patterns are you excited to try first? Thanks for the link up! Awesome, valuable post!